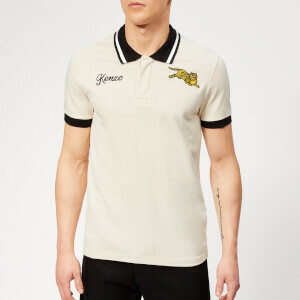 The KENZO logo polo combines structure with a graphic logo to form a modern design. Made from pure cotton, the short sleeve polo features a large logo print across the front in contrast white, and striped white panels down both sleeves for a striking colourblock effect. Its straight cut lends the piece a slightly loose fit, ideal for tucking into trousers. Finished with a ribbed collar, concealed three button placket and embroidered 'K' detail to the back yoke.